GPs and practice nurses should receive more training in mental health, according to a charity, after new research has revealed almost half have not undertaken training in it. Data obtained by mental health charity Mind shows that in England, on average, only 46% of trainee GPs undertook a training placement in a mental health setting. Furthermore, the only mental health-related option offered to trainee GPs was in psychiatry, which is based in hospitals and secondary care-focused. Additionally, while qualified GPs are required to undertake ongoing training in order to continue to practice, but, at the moment, none of the hours they spend on Continued Professional Development need to have a mental health component. This is despite an estimated 1 in 3 GP appointments being related to mental health, according to a 2014 report by London Strategic Clinical Network for Mental Health. Meanwhile, 82% of practice nurses said they feel ill-equipped to deal with aspects of mental health for which they’re responsible and 42% said they’d had no mental health training at all. The vast majority of people with mental health problems who do get treatment are seen within primary care – 81% of people first come into contact with mental health services via their GP, with 90% receiving treatment and care for their mental health problem solely in primary care settings. Mind’s report ‘Better equipped, better care: Improving mental health training for GPs and practice nurses’ calls on the government to ensure all GPs and practice nurses receive structured mental health training that is comprehensive, relevant and supports their ongoing development. 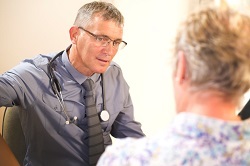 Paul Farmer, chief executive of Mind, said: “For most of us, our local GP practice is the first place we go when we’re unwell – whether it’s related to our physical or mental health. GPs and practice nurses have an incredibly difficult job to do, under enormous pressure and demands. “A significant number of patients they come into contact with will have experienced mental health problems, yet many primary care staff tell us they haven’t had sufficient training to be able to deal with them. That’s why we’re urging the government to ensure structured training is in place for trainee and qualified GPs and practice nurses. Kathryn Yates, Royal College of Nursing professional lead for primary and community care, added: “Mental health problems account for a huge amount of the demand on primary and community services, but this is simply not reflected in the training available. All health and social care staff should view mental health as an essential part of their job, from encouraging people to speak up and seek support or treatment, to supporting families and keeping people as well as possible at home. Professor Maureen Baker, chair of the Royal College of GPs (RCGP), said: “Mental health is a key component of the RCGP training curriculum that all GP trainees must follow and demonstrate their competence in before they can practise independently as family doctors in the UK. “We have been making the case for some time that specialist GP training should be extended from 3 to 4 years in order to focus more time on mental health, and child health, reflecting the changing GP caseload and the increasing number of patients who are presenting with mental health issues. We hope that today’s call from Mind will help strengthen our case. “GPs must undertake Continuing Professional Development as part of their appraisal and revalidation, but it is not the remit – or wish – of the College to specify how GPs should do this or what particular areas they should focus on. “We are very supportive of protected learning time for GPs, although it is hard to see how this could happen in the current climate where overstretched GPs are already working longer and longer hours and seeing more and more patients to try and keep pace with demand. “Today’s figures underline the urgency of implementing the pledges made in NHS England’s GP Forward View for greater investment in general practice services and for every GP practice to have access to a dedicated mental health therapist.